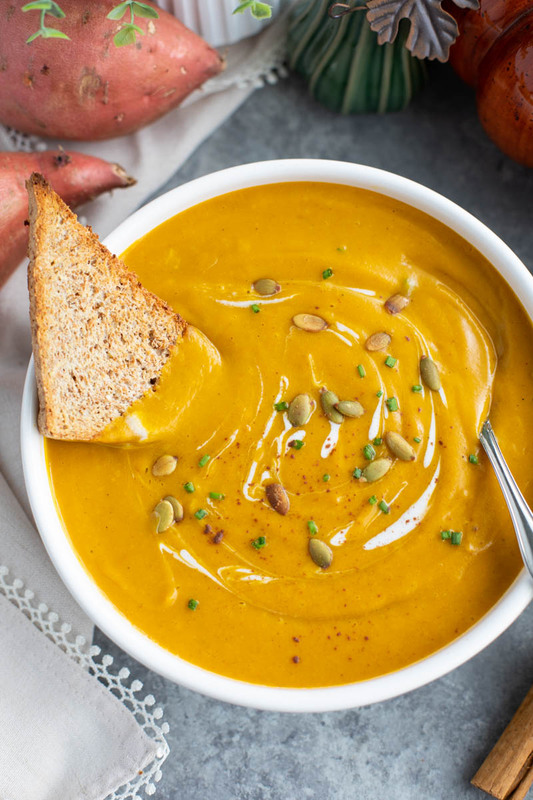 I make this creamy ginger pumpkin carrot soup every fall! It’s loaded with flavor from simple ingredients that you probably have in your pantry right now! Vegetarian, gluten-free and dairy-free. Can I get a woot woot?! Sorry, I know I’m corny but it’s exciting! If you don’t get excited about the little things then everyday life is dull. So, yes, I choose to get excited about ginger pumpkin carrot soup. I decorated our front porch with hay bales, mums, pumpkins, and a silly-not-spooky scarecrow, and made stuffed acorn squash for dinner last week in preparation for all things pumpkin this week! I have to start Travis out slow and close to Halloween otherwise, he’ll be over it real quick. If it was up to me, I’d be eating ginger pumpkin carrot soup from September to November!